The Dow Jones index drops slightly at the opening of the European session. 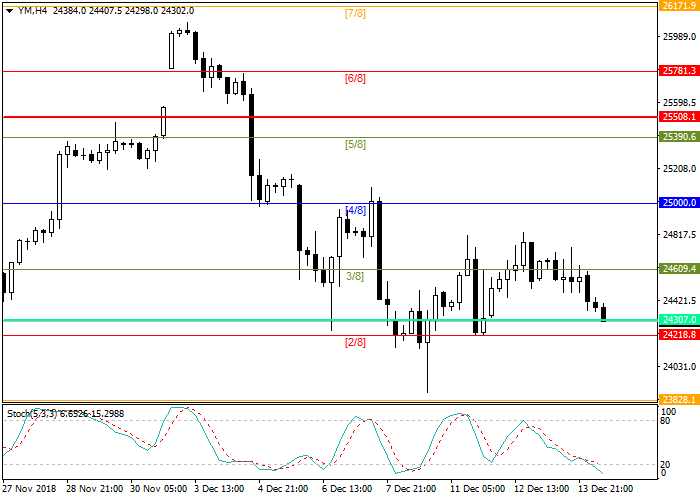 The nearest support level is located at 24218.8, if it is broken, the next target will be the level of 23828.1. Market participants react to the negative macroeconomic statistics of the Asian market: the volume of industrial production in China was much worse than expected (5.4% vs. 5.9% a month earlier); retail sales also slowed down to 8.1% against 8.8% in November. Weak statistics may be due to trade wars between the United States and China. As for the United States, yesterday's data on initial jobless claims came out better than forecast, reaching 206K. The yield on ten-year bonds has declined, although if data on the economy will continue to be positive, the Fed will continue to tighten monetary policy, which in turn will be a positive signal for the growth of the risk premium for debt securities and adversely affect the stock market. In addition, a negative point for the stock market is the decline in the value of General Electric's securities, which have dropped below $7, reaching the lowest level since the 2008 crisis. Today, data on industrial production and retail sales will be published in the United States. The Stochastic indicator is at the level of 15 and signals a possible asset correction.